NEW HAVEN, Mo. – Successful predator hunting is a definite ground game, requiring high mobility punctuated by long stretches of absolute stillness while working a set. 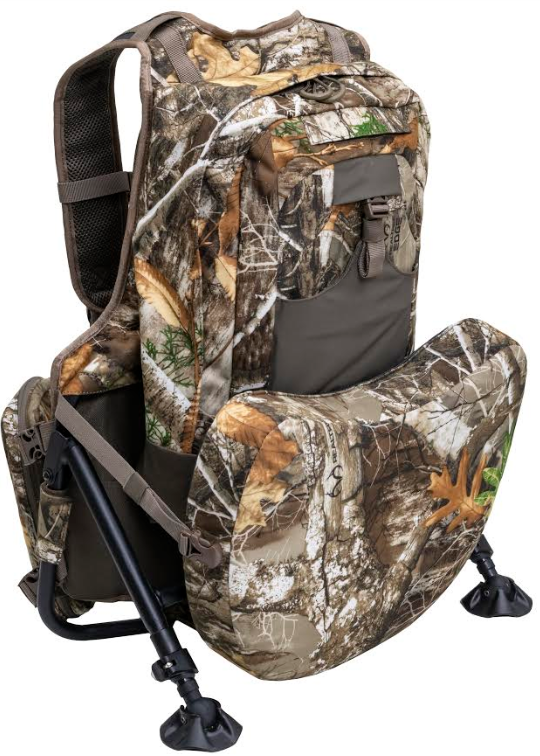 The new Enforcer pack from ALPS OutdoorZ was developed to meet the rigorous demands of on-the-go predator hunters who need a comfortable means to haul gear plus sit at ease in any environment. The Enforcer wears like a conventional pack, with adjustable shoulder harnesses, sternum strap, and waist belt to accommodate warm or cold-weather clothing. Further reducing carry strain and fatigue is a thickly padded back panel featuring ventilation channels. The heart of the Enforcer system is a plush 3-inch memory foam seat and kickstand frame. The seat folds up behind the pack via two compression straps and secures out of the way while travelling. To use, simply lower the seat for a warm sit on even the coldest, hardest ground. As with the seat, the kickstand frame folds behind the pack yet can be quickly deployed to provide a comfortable back rest. The legs offer individual length adjustability to offer upright seating on uneven terrain. Large swivel feet at the base of each leg presses flat against uneven surfaces for a sure grip and to prevent sinking into soft soil. Both the seat and kickstand frame can be removed, allowing the pack to be used as a conventional daypack. In addition to the main cargo compartment and exterior front pockets, which are designed to accommodate calls, decoys, and everything you need for a day-long hunt, there are two large removable pockets integrated into the waistband. These pockets are subdivided with quick-access mesh pockets to stow small items. The left pocket includes a shotgun shell strap that holds six cartridges while the right pocket strap can secure 12 centerfire rifle cartridges. The tall pocket lids can be laid open while sitting to make reloading quick and easy. For more information about this and other innovative hunting solutions from ALPS OutdoorZ, visit http://www.alpsoutdoorz.com/.